The tale of Calipari, who is poised to reach the final four with a young Kentucky team that features a number of freshmen seemingly destined to spend just one year in college basketball, is a perfect example of how while schools certainly want to run a clean program, the most important thing is winning on the court. 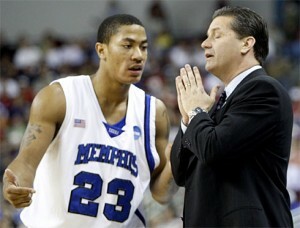 Just two years ago, Calipari was leading Memphis to the NCAA Tournament Finals with another freshman, Derrick Rose. That appearance marked Calipari’s second trip to the Final Four as he led the University of Massachusetts there in 1996. Derrick Rose and John Calipari answered short-term prayers in Memphis, but the memory of their NCAA run has been exponged from the NCAA records. Or at least that is what my memory tells me happened. If you now look at the official records of the Final Four according to the NCAA, you won’t see either the 1996 Minutemen or 2008 Tiger listed. Because of a variety of improprieties and rules violations, both teams have had their appearances expunged from the official NCAA records. Thus, as Calipari looks to take Kentucky to the next step and win a title, the real question isn’t necessarily whether they will win the title, but if in two years the NCAA will still recognize their accomplishment. Could Calipari become the first coach in NCAA history to coach in three Final Fours, but officially never have a team recognized for appearing in the prestigious championship? After twice leading programs that have been reprimanded by the NCAA and had titles expunged, you might wonder how Calipari landed what is arguably the most prestigious job in college basketball. In my opinion, the reasons are simple: money, greed and ego. The University of Kentucky reached great heights under the leadership of Rick Pitino and then in the early years of the tenure of Tubby Smith. They reached three straight title games between 1996 and 1998 and twice won the title. However, the 1998 championship marks the last time UK has reached the Final Four. That is why despite running a clean and reputable program that between 1999 and 2005 won four SEC titles and reached the Elite Eight three times, Smith exited following the 2006-07 season. It only got worse in two years under Billy Gillespie as they lost to such vaunted programs as Gardner-Webb and VMI. In 2009 they missed the NCAA tournament for the first time in 18 years. Gillespie was quickly jettisoned and it was clear that to return to relevance in major college basketball, UK needed to make a big splash. Calipairi, who had rebounded nicely from the end of his tenure at UMass and from a disastrous tenure in the NBA with the New York Nets, was the perfect candidate to get the Wildcats back on top. Having taken Memphis, the only school not in a BCS Conference to play for the National Title since the conference distinctions came about a decade ago, as far as he could hope (and perhaps also knowing that NCAA punishment was on the way), it was a perfect time for Calipari to head to the Bluegrass state. In his first season at Kentucky, Calipari has done exactly what the UK faithful believe is their inalienable right. He has taken them back to the brink of a national title with a 34-2 record. That he has done it by clearing the roster of players who were previously on scholarship and instead bringing in a number of players who will likely be in the NBA next season means very little to the success-craved fans. At least so far, it appears that the marriage between Calipari and UK is a perfect fit. However, if the NCAA one day tells UK they must remove any conference or NCAA banners associated with the one-hit wonders, or if next year’s crop of newcomers doesn’t reach the same heights of success, you can bet that the UK faithful will suddenly claim that they never thought bringing in one-year players was a good idea. But, if history is any guide, by then Calipari will be off on his next adventure and the cleanup will be left to someone else. Urban Meyer has enjoyed great success on the field for the Florida Gators, but at what price? Unlike Calipari, who has generally enjoyed a friendly relationship with the media (which might be part of the reason he has gone generally unscathed from the NCAA violations that he wasn’t directly tied to, but that occurred in the programs he oversaw), another coach who has enjoyed great recent success has not had such a rosy relationship with the media. For whatever reason, most major college football coaches have an adversarial relationship with the media. That is definitely the case for Urban Meyer, who has won two national titles at the University of Florida, but has treated any criticism (whether from the media or former Gator players) as acts of treason. He also has seemingly spent the last four months playing a game of “it’s sort of a big deal, but it is none of your business” with the local media. In late December, after losing the SEC title game to the University of Alabama, Meyer made national headlines by announcing that he was resigning due to health concerns. The news sent shocks across the college football landscape. Officials from the University of Florida were quick to make it known that they had encouraged Meyer to take a leave of absence, but he insisted resigning was the best course for him and his family. Not surprisingly, Meyer changed his mind just 24 hours later and instead said he would take an indefinite leave of absence after their Sugar Bowl game. They even made assistant coach Steve Addazio the “interim” coach. Remember the old parable about if a tree falls in the woods and no one hears about it does it make a noise. Well, if a college football coach goes on sabbatical but no one can tell did he really go? It was originally suggested that Meyer would not be involved in hiring new staff members or in recruiting during his time away and would probably miss spring practice. 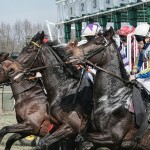 It was also inferred that he would be giving up his blackberry to ensure he was really away and taking care of himself. Well, those who closely follow the Florida program say that Meyer’s absence was really more like a brief vacation than a sabbatical and that it started after he hired assistants and secured the top recruiting class in America and then ended before spring practice. He was also caught on camera during a UF basketball game using his blackberry. Of course, Meyer’s health and personal life are his business, but when he announced to the world that he was leaving coaching because of his health, it instantaneously became the business of every member of the Gator faithful as well as the media that follows the team and college football. In typical “It’s my World and my Rules” fashion, Meyer has refused to answer any questions about his leave of absence, his return or his health. But this past week Meyer showed that he is still wound tighter than a drum during an exchange with a member of the media. After using a quote from a Gator receiver describing new UF starting quarterback John Brantley as a “real quarterback”, compared to former starter Tim Tebow, Meyer publicly embarrassed the reporter and threatened to forever cut access to the team for him newspaper (The Orlando Sentinel). Meyer has a very close relationship with his quarterback Tim Tebow and is still protective of the all-time college great. The article made it clear that the player really meant to infer that unlike Tebow, Brantley is a conventional drop-back quarterback. Of course, like is often the case when dealing with quotes, the comment was taken out of context on Twitter and in other places where only the “real quarterback” comment made the news. Now I am as big a fan of Tim Tebow as anyone. As the son of a Gator and having been born in Gainesville, I have always followed UF and very much enjoyed watching Tebow give it everything he had during four years and two national titles. I also have written on this blog that I firmly believe that Tebow will be a very successful pro and that any team that passes on him (especially in the second round or later) is foolish. Yet, I am not so naïve that I don’t recognize that Tebow is not Peyton Manning or Tom Brady. If Tebow is able to develop into a successful NFL quarterback, it will be due to his determination, leadership and heart as much as his ability as a passer. In lashing out at this reporter, Meyer seems to be so concerned about Tebow’s legacy and reputation that anything potentially being critical of him is seen as being a type of hieracy. Last time I checked, Tebow had yet to walk on water and as best I can tell without having met him, Tebow doesn’t pretend that he is better than everyone else. He recognizes that it will take a lot of work for him to become a successful NFL quarterback and to his credit seems to be doing everything he can to position himself for success. 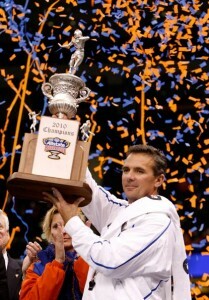 I wish Meyer would take a cue from his young quarterback and mellow out a little. No one is trying to cut down Tebow’s legacy. Regardless of whether he has any success at the next level, Tebow will go down as one of the greatest college football players of all time. Instead of feeling he has to defend Tebow and in a weird way his current player, Meyer needs to recognize that in the fish bowl in which he lives he may be able to make his own rules, but the rest of the world doesn’t have to follow. If Tebow indeed doesn’t make it as a pro, there will be nothing he can do about it. Similarly, rather than attacking anyone who doesn’t follow his rules or write things he agrees with, Meyer should recognize that it isn’t really him against the world. No one who follows the Gators really has it out for him. In fact, I think you could argue that the Gator faithful are probably more concerned about his health than he seems to be. They simply want to make sure that their leader is taking care of himself, so that there isn’t an occasion in a year or two where he absolutely has to quit because of his health or, God forbid, he suffers a heart attack while on the sidelines coaching a game. Because, Meyer may think he can play by his rules, but ultimately, we all play under God’s rules and God doesn’t listen to the NCAA and doesn’t really care about salaries or national championships.